Rising #Medicaid spending on #prescriptiondrugs has prompted many states to look for new ways to control such costs. What initiatives are states considering? Due to the structure of Medicaid’s rebate program, states are generally obligated to provide a drug to their beneficiaries when it comes on the market and currently cannot exclude high cost drugs from their programs. In the early 2000s, prescription management programs, which included preferred drug lists, supplemental rebates, and script limits, were implemented and expanded by states in an effort to control costs.6 However, these programs have reached maturity, and states, facing the prospect of more new and costly drugs coming to market, are now looking to develop new ways to achieve savings in the prescription drug program. This issue brief provides a snapshot of current state initiatives aimed at addressing the cost of prescription drugs in Medicaid. Background: How does Medicaid pay for prescription drugs? Many states also use pharmacy benefit managers (PBMs) in their Medicaid prescription drug programs. PBMs perform financial and clinical services for the program, administering rebates, monitoring utilization, and overseeing preferred drug lists.12 PBMs may be used regardless of whether the state administers the benefit through managed care or on a fee-for-service basis. What policy levers have states traditionally used to control Medicaid drug spending? Within federal rules regarding the federal rebate agreement and medical necessity requirements, states have flexibility in administering their Medicaid prescription drug programs. States have used a variety of strategies to contain pharmacy costs and have done so for many years. Common strategies include implementing prescription limits, negotiating supplemental rebates, requiring prior authorizations, and using state Maximum Allowable Cost (MAC)13 programs. States also have joined multi-state purchasing pools when negotiating supplemental Medicaid rebates to increase their negotiating power, and states have switched ingredient cost methodologies.14 Most state Medicaid programs also maintain a preferred drug list (PDL) of outpatient prescription drugs,15 which is a list of drugs states encourage providers to prescribe over other drugs. A state may require a prior authorization for a drug not on a preferred drug list. PDLs create incentives for a provider to prescribe a drug on the PDL if possible. Often, drugs on PDLs are cheaper or include drugs for which a manufacturer has provided supplemental rebates. While states may require prior authorization, restrict access to drugs only being used for medically accepted indications, or not cover certain specific drugs that are listed in the statute, outside of these allowances, they are required to provide nearly all prescribed drugs made by manufacturers that have entered into a rebate agreement. 16 This requirement holds regardless of whether the beneficiary receives prescriptions in a managed care or fee-for-service setting. States have used these strategies in Medicaid for many years (Figure 3). However, such actions have slowed in recent years as economic conditions have improved and states reach the limits of utilization controls allowed under federal law (Figure 4). 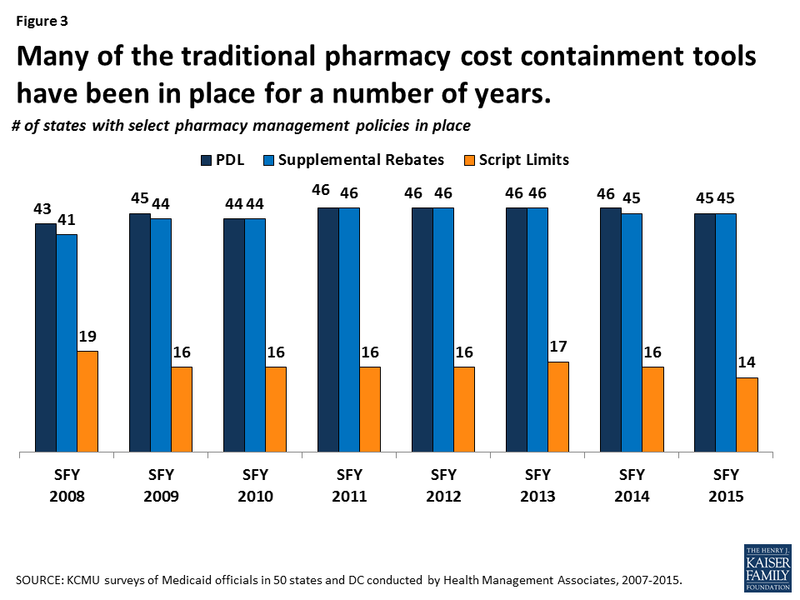 Figure 3: Many of the traditional pharmacy cost containment tools have been in place for a number of years. 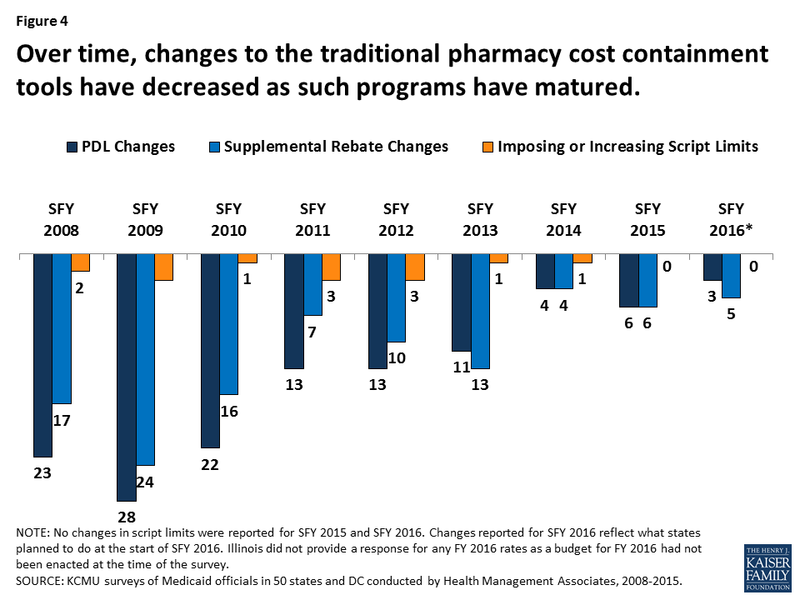 Figure 4: Over time, changes to the traditional pharmacy cost containment tools have decreased as such programs have matured. Many state Medicaid programs implemented utilization controls for Sovaldi: in 2014 and 2015, over half of the state Medicaid programs had implemented prior authorization restrictions for DAAs, and nearly all of those based the prior authorization on the degree of the patient’s liver damage.18 In addition to restrictions based on the extent of liver damage, some states also required that a patient meet with a specialist, as well as drug counseling, drug testing, and periods of abstinence from drugs and alcohol. However, these restrictions were inconsistent with treatment recommendations and with federal law about drug utilization control. Class actions were filed in federal courts in a number of states, and in May 2016, a federal court issued a preliminary injunction ordering Washington State to provide DAAs to all Medicaid beneficiaries with the virus.19 Following these legal actions, many states loosened restrictions on DAAs, and some now provide DAAs to all Medicaid beneficiaries. Despite increased competition,20 DAAs remain expensive, and states continue to grapple with the high cost of specialty drugs. In addition, although states have placed particular focus on DAAs, they remain vigilant about other high cost drugs as well, such as hemophilia, oncology, and diabetes classes of drugs.21 Most states have been looking for new ways to control drug spending. What new Medicaid strategies are states trying to control drug spending? Some new strategies that states are trying aim to expand the scope of efforts already underway in Medicaid or implement new Medicaid policies not previously allowed under federal law. In general, these efforts share a goal of obtaining greater supplemental rebates from manufacturers. Currently, states use placement on their PDL as a means to negotiate supplemental rebates. States often join in multi-state pools to have greater leverage to obtain supplemental rebates.22 New strategies include state spending caps for Medicaid prescription drugs and a proposal of a closed formulary in Medicaid. One idea currently being tested is use of a spending growth cap for Medicaid prescription drugs. If spending is above the cap, the state undertakes close review of drug spending and targets certain drugs for additional utilization review. New York is currently implementing such a process. The state has had a spending cap on its Medicaid program since 2011.23 However, drug expenditures have continually grown faster than other cost components under the cap.24 As a result, in April 2017, the governor signed into law25 the addition of a drug cap as a separate component of the spending cap. Under this drug cap, if total Medicaid drug spending in a year is projected to exceed the growth target, the state Commissioner of Health may identify specific drugs for referral to a Drug Utilization Review Board (DUR Board)26 and reach out to the manufacturer to see if they can agree on a satisfactory rebate for the specified drugs. If the Department of Health and the manufacturer cannot reach an agreement, the Commissioner may refer the drug to the DUR Board, which considers a variety of factors about the specified drugs, such as the cost of the drug including rebates, its impact on the drug spending growth target, and its value to Medicaid beneficiaries. After considering these factors, the DUR Board may seek additional supplemental rebates with the manufacturers. If the department is unable to obtain the desired additional supplementary rebates, the manufacturer must provide information to the department on the drug in question including the cost of development and manufacturing, R&D costs, advertising costs, utilization, prices charged outside the U.S., average rebates, and average profit margin. This information is not provided to the public. Ultimately, if Medicaid drug spending is greater than the annual growth rate, the Commissioner can further limit access to the drug through existing utilization controls allowed under current law. As stated earlier, once a manufacturer signs a Medicaid rebate agreement with the Secretary of HHS, states must provide nearly all of that manufacturer’s drug products to its Medicaid beneficiaries, essentially creating an open formulary. States can use PDLs to provide incentives for prescribers, but the state must still make drugs not on the PDL available after the prescriber has received a response for prior authorization if the drug is prescribed for a medically accepted indication.27 This approach stands in contrast to a closed formulary, under which only specific drugs in each therapeutic class are covered. Some feel that allowing states to implement “widely-used commercial tools”28 such as closed formularies would allow states to negotiate greater rebates, because each manufacturer would want their drug to be included as one of the few drugs for the therapeutic class. The administration has also expressed interest in state Medicaid programs having the ability to utilize formularies, as is done in the private sector. The FY 2019 budget* calls for a new Medicaid demonstration authority to enable up to five state Medicaid programs to create their own formularies and negotiate directly with manufacturers instead of participating in the Medicaid Drug Rebate Program. Prices negotiated through this demonstration would be exempt from Best Price (see Appendix). These states would also maintain an appeals process for non-covered drugs. The Administration also calls for actions to increase the number of generic drug applicants. In September 2017, Massachusetts submitted an application to CMS that included a provision to amend its Section 1115 Medicaid demonstration waiver to create a closed formulary.29 The state specified that the closed formulary would include at least one drug per therapeutic class and that the state would have the ability to exclude drugs with limited evidence for clinical efficacy. However, the state Medicaid program would also include an exceptions process for drugs not included in the formulary. The application is pending as of the publication of this brief. In November 2017, the state of Arizona indicated to CMS that it is considering a similar proposal in its upcoming Section 1115 waiver amendment. What broader efforts are states trying to control drug spending? In addition to actions within Medicaid, states are undertaking efforts to control drug spending across payers. While not specific to Medicaid, these activities would also affect Medicaid drug spending. 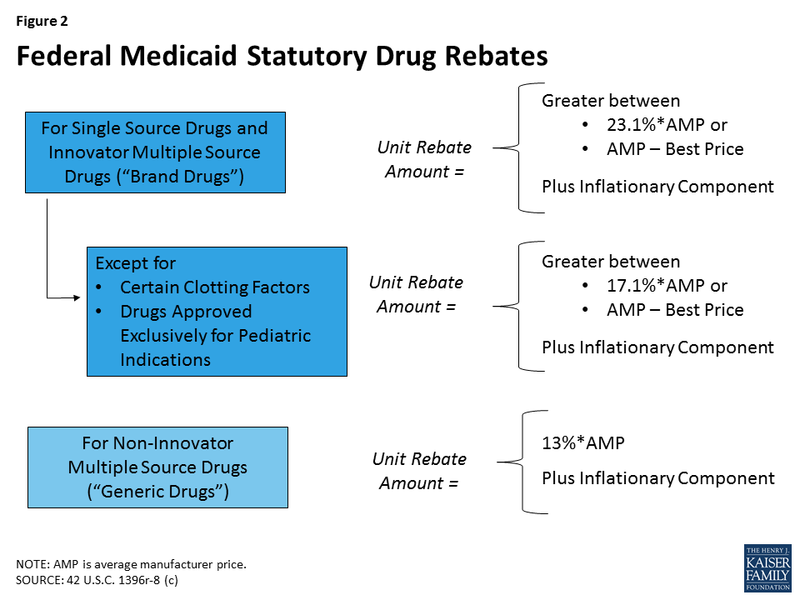 Since January 2017, the Medicaid Drug Rebate Program has incorporated an inflationary component in the calculation of rebates for generic drugs that aims to keep the net price increase to Medicaid flat in real dollars.33 However, due to the complex nature of pricing and reimbursement, this mechanism does not necessarily limit all cost increases for generic drugs in Medicaid, as Medicaid payments to pharmacies use a separate (though related) payment base. Additionally, even limiting Medicaid spending for generics to inflation is problematic, as the expectation is that the price of generic drugs will decline over time due to competition. States have been taking action to address the cost of generics and shift utilization towards lower cost generics and biosimilars. These actions include new laws to prevent price gouging, lawsuits to recoup damages from alleged collusion in price increases, and efforts to promote biosimilar substitution for biologics. * Scott Gottlieb, “FDA Working to Lift Barriers to Generic Drug Competition,” FDA Voice, June 21, 2017, https://blogs.fda.gov/fdavoice/index.php/2017/06/fda-working-to-lift-barriers-to-generic-drug-competition/. ** “FDA Tackles Drug Competition to Improve Patient Access,” June 27, 2017, https://www.fda.gov/NewsEvents/Newsroom/PressAnnouncements/ucm564725.htm. Other state activity to prevent price increases for generic drugs focuses on the courts. Since 2014, the state of Connecticut has been investigating suspicious pricing of certain generic manufacturers. In 2017, attorney generals from 45 states, in addition to DC and Puerto Rico, brought forth allegations accusing 18 generic manufacturers and their subsidiaries of collusion. They allege that the manufacturers worked together to divide the market, and then designated companies stayed out of the bidding process for customers or placed bids that they knew would not be accepted.36 This lawsuit is pending as of the publication of this brief. Many see drug pricing transparency as key to addressing the high cost of drug prices,43 as there are many opaque aspects to the pricing of prescription drugs in general and specifically within Medicaid. 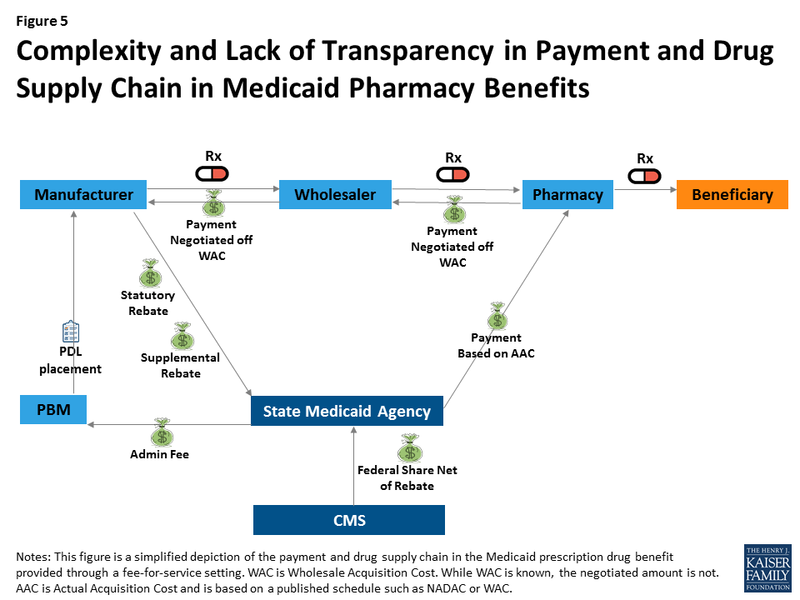 Within Medicaid (and for most other payers), payment for drugs goes through a complex process in which wholesalers pay manufacturers, pharmacies pay wholesalers, and states pay pharmacies; however, manufacturers provide rebates directly to states (Figure 5). At each point in the payment chain, there are many unknown factors affecting pricing. For example, many parts of drug reimbursement are based on manufacturer-set list prices for a drug: the WAC or the less frequently used “Average Wholesale Price” (AWP).44 Manufacturers do not provide public information on how they set this list price and historically have not been required to explain changes in a product’s list price. WACs are the basis for negotiated payment between the manufacturer and wholesaler as well as the wholesaler and the pharmacy (Figure 5). In addition, WACs affect Medicaid reimbursement schedules, as they feed into the NADAC. Additionally, some states continue to use WACs when NADACs are unavailable.45 The WAC is available to the public, but it is difficult to obtain WACs efficiently on a large scale or over time without using drug pricing compendiums available for purchase. Thus, there is limited public information on a core component affecting drug pricing system-wide. Manufacturer transparency laws focus on making public information about WACs, which feed into prices and payment throughout the system. Vermont was the first state to pass drug transparency legislation in June 2016. It did so with the purpose of understanding drug cost drivers statewide. The Vermont law54 directs the two separate agencies55 to collaborate to identify up to 15 costly drugs from separate drug classes with large WAC increases, posting them online. The manufacturers must then provide justification for these price increases to the Attorney General, who will present findings to the General Assembly. In October 2017, California passed a law similar to the Vermont transparency law but larger in scope. Under the California law,56 manufacturers must report to the state information for drugs with WACs greater than $40 a month with cumulative WAC increases over the course of the two years prior above specified amounts. Manufacturers also must report WAC data, as well as other information for new products that qualify as specialty drugs in Medicare. In addition, manufacturers must alert the public 60 days in advance of any drugs that will experience specified WAC increases.57 Ultimately, however, manufacturers are not required to report anything that is not already publicly available, albeit in a less accessible format. Health care service plans are also required to report annually to the state the 25 most prescribed, the 25 most costly, and the 25 drugs with the highest increase in year-over-year spending. The state will then summarize this information for public release. In June 2017, Louisiana passed a pair of laws requiring that manufacturers make quarterly reports of WACs and that the Louisiana Board of Pharmacy post these WACs online for the public.58 Although seemingly much simpler than other laws related to WACs, the Louisiana law could create the most comprehensive, accessible, and free set of list prices for use by the public among any of the new laws. Other programs that purchase prescription drugs, in particular federal programs, have policy levers beyond those currently available to state Medicaid programs. Some states are looking to draw on these and other resources of the federal government in their efforts to control prescription drug spending. As states test policies or take legal action, other states are considering what efforts succeed and could be adopted in their state. Several actions require federal approval (e.g., Massachusetts’ 1115 waiver request) or have met pushback from the pharmaceutical industry79, and states are watching these policy discussions to determine what is feasible and could be a new policy lever in controlling prescription drug spending.80 Additionally, legislation addressing transparency, generic price gouging, and methods for obtaining additional supplemental rebates have only recently gone into effect, and the effectiveness of these laws has yet to be seen. Pharmaceutical companies may decide that it is more economical to pay the penalties for failing to provide transparency data or for failing to restrain from increasing list prices than comply with the new legislation in California or Maryland. However, while some actions may be feasible for each state to take on individually, just as generic substitution laws worked their way through state legislatures in the 1970s,81 some actions, such as urging certain types of federal action, may be more effective if coming from a coalition of states.82 Meanwhile, states continue to cite the cost of prescription drugs, and in particular high-cost specialty drugs, as a budgetary concern. 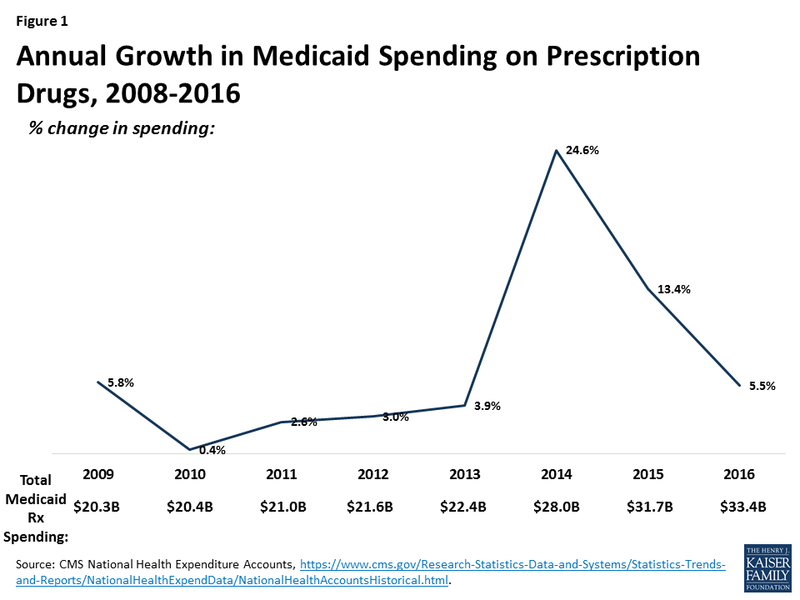 It is unclear whether Medicaid drug cost growth will continue to slow or whether more states will seek to target this area for cost control measures. What Initiatives Are States Considering To Control Prescription Drug Costs in Medicaid?